Backpacks are definately making a comeback this year as seen in many brands. 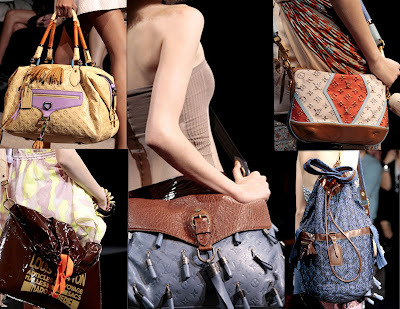 Louis Vuitton's spring 2010 featured huge bags. Messenger, duffle, backpacks, and shoulder bags. Wire handles, pastels, fringes. Didn't like the show, the clothes were so urban and too sporty. Models were sporting a huge afro wig. The shoes were a no-no with their fur (dont know if its part of the show or really how the shoes were going to be sold). In the other hand, I loved the fall collection, the one on display now worldwide. Its one of my top brands for this fall and so like LV. 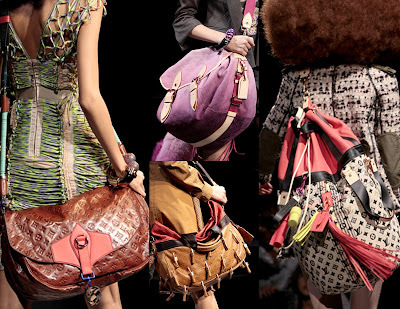 I'm not a big fan of the brand when it comes to LV bags, but some of you divas may be interested in getting a. overpriced duffle or messenger bag with a twist. That dark brown messenger with the blue handles is gorgous!